My friend Donna, founder of the Cookistry blog, lost her husband suddenly last week. When someone passes, my first thought is to make food. I can’t do anything about the loss, but I can at least ensure folks don’t have to worry about cooking. Unfortunately, Donna lives more than 1,700 miles away. Since I couldn’t really deliver a homemade meal, I decided to do the next best thing. 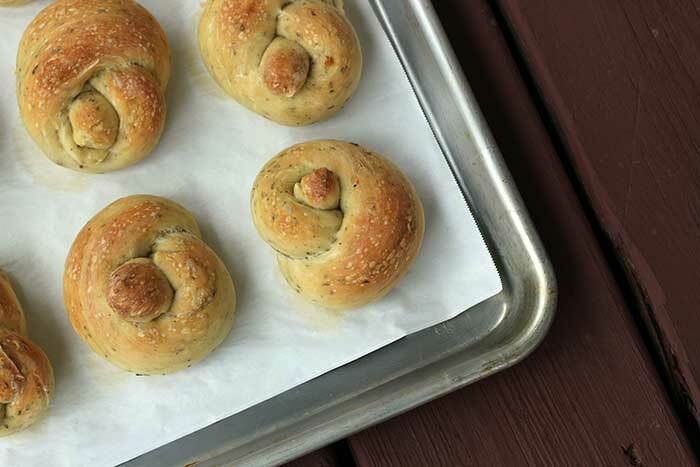 I made the Garlic Knots from her cookbook, Make Ahead Bread (affiliate link), and shared it with my best friend. Somehow I think Donna would like that. PS: Hi, I’m Paul Shaffer. PS: I’ve been on TV quite a bit. While the CompostMaster was hob-nobbing with the rich and famous, I spent time with my BFF. We browsed a bookstore, indulged in ridiculously expensive coffee drinks, and then settled back at her house for food and football. I took an old chicken lasagna recipe and prepared it with spaghetti squash instead of noodles. Since I cut out most of the carbs from our main dish, I didn’t feel too guilty about eating a couple of Garlic Knots. Combine all ingredients and knead by hand (mix first in large bowl, then turn out and knead) or in a stand mixer fitted with the dough hook until the dough is elastic. Cover bowl with plastic wrap or a lint-free towel and let the dough rise until it has doubled in size, about 1 hour in a warm room. Turn out the dough onto a lightly floured work surface. Divide dough into 12 equal portions, then roll each piece into a rope about 10 inches long. Tie each rope into a single loose knot. 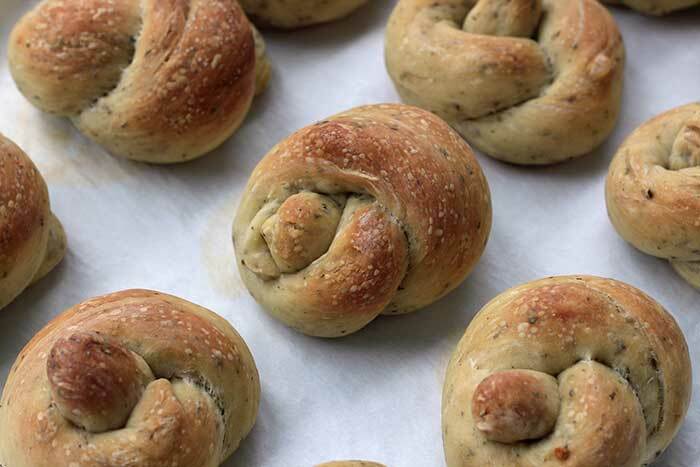 Place knots on the baking sheet, leaving room between them to rise. Spray plastic wrap with cooking spray and cover the baking sheet (sprayed side down). Place in refrigerator. Remove pan from refrigerator and preheat oven to 350℉. Remove the plastic and bake the rolls until they are nicely browned and the internal temperature is 195℉, about 35 minutes. Transfer to a wire rack and let cool. Donna's original recipe called for chives and a garlic-infused olive oil. I decided to go with Italian flavors, garlic seasoning, and unflavored olive oil. Be creative and use whatever you like (or have on hand).